The Kawerau Geothermal System is near Kawerau township, and is centred on the flood plains of the Tarawera River between Pūtauaki/Mount Edgecumbe and the Onepū Hills. It has high levels of existing extraction for industrial purposes, as well as for heating the community pools at the Maurice Kjar Memorial Swimming Pool complex. Kawerau became the first geothermal production field in New Zealand in the 1950s, as part of the Tasman Pulp and Paper Mill development. 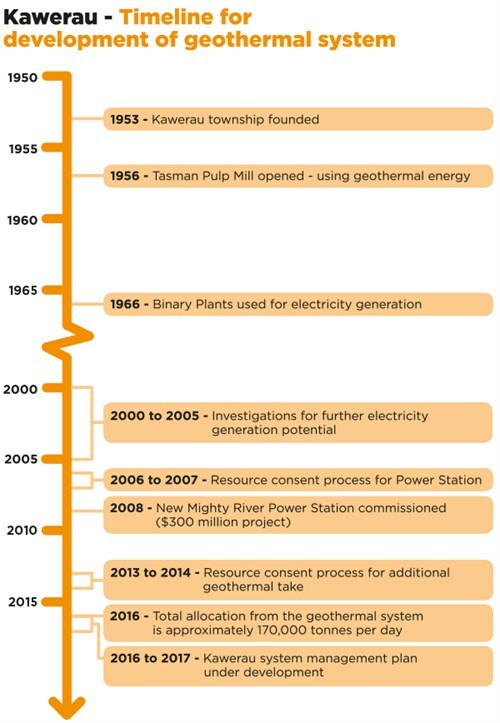 The system has been extensively developed since then and several companies now have consents to draw on the resource, including Mighty River Power, Ngāti Tūwharetoa Geothermal Assets, Eastland Developments, and Te Ahi o Māui. Production wells are typically between 1-2 km deep and downhole temperatures range from 250-315 °C. Steam is provided to industrial users for power generation, as well as paper and timber drying. More than 150,000 tonnes of geothermal fluid is consented to be used each day. This long history of development, along with multiple users and large number of wells, makes the Kawerau system complex to manage. Its state is closely monitored and modelled by users as part of resource consent conditions. Industrial use of the geothermal resource and electricity generation brings significant economic benefit to the region. Not all consented takes are currently in production, so use is expected to increase in the future. The community bathing pools in the Kawerau township were opened to the public in 1957, and continue to be a very popular facility. Historically the system had surface features, such as springs along the banks of the Tarawera River and the southern shore of Lake Rotoitipaku. However, these features have declined due to both natural and man-made causes. Seepages and steaming, hot ground still exist in some areas and some springs remain for local use. The Kawerau system is classified as a Development System in the Regional Policy Statement. It is managed under the Regional Water and Land Plan, which will be part of a wider plan change process in 2018. Council has worked with users to develop a System Management Plan, with the aim of efficient and sustainable management of the system. Council manages the Kawerau Geothermal System through resource consents for the taking of geothermal water and heat, and geothermal discharges. Council is assisted in this role by an impartial Peer Review Panel, consisting of three independent technical experts. Major consent holders report to the Peer Review Panel and Council about the state of the geothermal system on an annual basis. Council has summarised these reports to develop annual community reports on the state of the system. The Ngā Whakaaetanga-ā-Ture ki Te Taiao ā Toi (Statutory Acknowledgements in the Bay of Plenty) is a compendium document to be read as an attachment to and in conjunction with the Operative Rotorua Geothermal Regional Plan, including proposed regional plan or policy statement, and any variation or change notified by the Bay of Plenty Regional Council.